Conduction-cooled QCW arrays for pumping, illumination, and direct diode needs. PulseLife G-stacks set a standard of reliability for vertical conduction-cooled QCW diode stacks. Coherent’s proprietary PulseLife hard solder technology enables output powers of >200W/bar QCW and high operating temperatures, with reliability >109 shots. 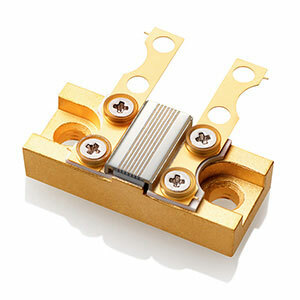 Standard packages are available with as many as 16 diode laser bars in a single stack. G-stacks are available in a wide variety of wavelengths including “rainbow stack” (multiple-wavelength) options for temperature insensitive pumping.